When:	Wednesday, August 31, 2016 @ 7:45 p.m. - 9:00 p.m. Originally started in Australia, International Overdose Awareness Day has been a key remembrance event for those who have died from fatal drug overdoses since 2001. Two community workers in Australia seized the opportunity to provide a platform to acknowledge the grief of family and love ones who have dealt with an overdose tragedy. They hosted a local event on August 31st where they distributed silver ribbons to anyone who wanted to remember someone who had died due to an overdose. The idea quickly spread and is now a globally recognized event where thousands of people worldwide will stand alongside the friends and families of fatal overdose victims to reflect on those who have been lost. The intent of IOAD is to not only respectfully remember those who have lost their lives by overdose, but to also raise awareness that overdose prevention is preventable. 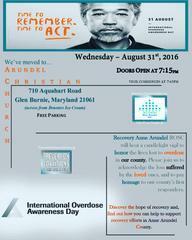 On August 31, 2106, Anne Arundel County will be hosting our first International Overdose Awareness Day. Please join us in remembering those lives we have lost due to overdose and let our citizens know THERE IS HOPE! Recovery Anne Arundel ROSC in conjunction with the Anne Arundel County Executive’s Office, Police Department, Fire Department, Department of Health, State’s Attorney’s Office, and the Arundel Christian Church will host a candlelight vigil to honor those lives lost to overdose in our county. We invite you, your clients, colleagues, family members, and friends to join us on Wednesday, August 31, 2016 as we host a candlelight vigil starting at 7:45 pm at the Arundel Christian Church, 710 Aquahart Road, Glen Burnie, Maryland 21061. Doors will open to the public at 7:15 pm.